Less than 5 minutes away from the District One hospital, Keystone of Faribault is a beautiful facility located at the heart of the country. Residents can locate a nearby hospital when necessary. Offering one or two bedroom apartments options and an escape from the busy city life, activities offered include field trips, social outings, events, and various games and prizes. Memory care options available for patients with those needs. Scheduled transportation provided for your residents. Great tasting food and delicious menu options. The best way to get to know a community is by scheduling a tour. 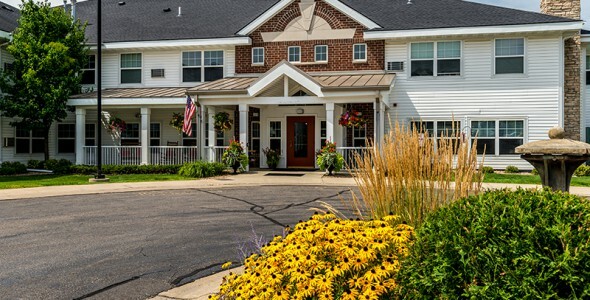 See the facilities, meet the staff and residents, and get a feel first hand what it's like to live at New Perspective | Faribault Assisted Living. At Keystone of Faribault we believe it is possible for seniors to live in a close-knit community setting and receive the supportive assistance they need to live an active life. This is why we designed our community to have a homelike atmosphere in each room and the helpful amenities, such as an on-site beauty salon and daily activities, which make life even more enjoyable. Our community features spacious one-and two-bedroom apartments that have the conveniences of full kitchens, spacious closets and an in-unit washer/dryer. Weekly housekeeping and laundry services allows our residents to spend time having fun instead of worrying about household responsibilities. Safety features include an emergency call system in the apartment and a personal pendant. We encourage our residents to consider the entire Keystone of Faribault community their home. Seniors can visit the library, craft room and participate in activities anytime they wish. There is also a Jacuzzi tub and lovely outdoor patio areas for an afternoon of relaxation. Three chef-inspired meals are served every day in the community dining room, and with dishes served restaurant-style, our residents feel as though they are dining out with each meal. Our Always Available breakfast, lunch and dinner menu means that our residents' favorite meals are always available. For each resident, we develop an individual care plan that details the level of services needed to promote well-being and an active life. All of our staff are specially trained to provide work with seniors, and are on site 24 hours a day. Residents needing memory care benefit from our signature Willows memory care community, which also features a women-only neighborhood. Here, we provide a non-pharmacological approach to managing dementia that allows our residents to experience enjoyment in their lives. New friends, a world of opportunity and professional, caring help is what seniors will discover when joining Keystone of Faribault.